Khan Academy’s mission is a free world-class education for anyone, anywhere. In September 2013, the academy had ten million unique visitors overall. For the art-history content alone, Khan anticipates more than two million visitors from around the globe for the fall 2013 semester. Let’s make sure strong, global art-history content is well represented. If you are interested in contributing your expertise in the form of short introductory essays to help make art history accessible to a global audience, Smarthistory could really use your help. The website’s founders, Steven Zucker and Beth Harris, seek art historians, archaeologists, and conservators in many areas of study; they have a particular need for specialists in African, Asian, precolonial American, and Pacific art. Smarthistory has created an interactive list of topics, a Trello Board, with an eye toward supporting introductory art-history courses. If something important is missing, please let Zucker and Harris know! Once you’ve decided on a topic, send an email to Zucker and Harris (along with your CV). If everything is in order, you will be added to the Trello Board, so you can claim that topic. As a general rule, Smarthistory looks for the narratives a great professor tells his or her class to make students fall in love with a particular subject or work of art. All accepted contributed content is published on both khanacademy.org and smarthistory.khanacademy.org. All content is published with a Creative Commons attribution and noncommercial license. You remain the owner of your content, and your contribution is always attributed. Can Yelp Change the Way We Think about Art? Slave of the Internet, Unite! The panel discussion on the sale of the collections of the Detroit Institute of Arts (DIA) presented on October 24th in New York City and organized by the International Foundation for Art Research (IFAR) raised many of the issues that characteristically surround a major art museum situated and owned by an economically ailing major city: economic necessity and the economic divide; the professional responsibilities of the state, the city, and the museum staff and board; the test of the concept of works of art held in the public trust; the politics of a Republican governor and a liberal African American city; moral responsibilities of museums and their communities; the nature of the intent of art donors and the future of gifts to museums; and the expectation that major donors and foundations should solve the city’s bankrupt state. The speakers were Graham Beal, Director of the Detroit Institute of Arts; Sam Sachs, former director of the Detroit Institute of Arts and President of the Pollock-Krasner Foundation; Frank Robinson, retired Director, Herbert F. Johnson Museum of Art, Cornell University; and Richard Levin, Partner & Head of Restructuring Practice, Cravath, Swaine & Moore LLP. The DIA has become the central issue in the media of the City of Detroit’s bankruptcy. The museum’s rocky economic history with the city and the state was presented by past director Sam Sachs. The museum was founded in 1885 by a group of private citizens called the Founders Society. As early as 1919 the Founders merged with the City by ceding the collections in return for city-supported maintenance. Over the years the city support decreased and the Founders sought assistance from the state. That support reached a high point of $17 million in 1985. By 1991 the state support was cut in half. In 1997 the museum was reprivatized so that the city retained the collections that were supported through city funds but most other support was provided by the Founders Society. The irony of this present controversy is that the DIA has never been in better fiscal shape nor has its audience, thanks to new educational initiatives, been so diverse. The DIA raised $360 million in the past few years and in 2012 three suburban counties adjacent to Detroit approved a tax to support the operating costs of the museum for the next 10 years. However, the counties have already publicly stated that they would withdraw this support if the DIA’s collection is sold. According to Beal, this would essentially cause the closure of the museum. The museum director, board members, administrative staff and lawyer have been prevented from meeting with the governor, the emergency manager or the attorney general of Michigan, who has already issued the decision that the DIA is a public trust and cannot be sold. A proposal to shift the ownership of the DIA from the city to the state has been blocked by the state legislature. Thus, the DIA leaders have been, as Beal said, “treated with disdain” by those in political power and have had to rely on the media and hearsay for information. The only contact they have had with the emergency manager’s office was his request for an inventory of the collections. When the DIA complied with a 1,640-page list of objects in the collection (using 10-point type and single-spaced formatting) the emergency manager’s office realized the complexity of the issue. The DIA legal counsel, Richard Levin, made it clear that, according to municipal bankruptcy law, the state, not the federal government, has authority. In this case, the governor of Michigan appointed an emergency manager, Kevyn Orr, to oversee the city’s finances; he is the sole decision-maker on the preparation of a plan to sell assets, pay creditors and bring the city back to solvency. The current court case in the Eastern District Court of Michigan that was brought by the unions and pension fund managers questions the validity of declaring bankruptcy in the first place. The governor, attorney general and emergency manager will be called to testify. Levin emphasized that municipal bankruptcy proceedings usually go into settlements and that the settlements take so long that, “the patient usually dies on the operating table,” and as Beal stated, “a dead DIA is exactly the opposite of putting the city back on a good course.” The Oakland County manager, Brooks Patterson, told Beal that in order to attract corporations and investors to their county in competition with other major cities like Boston and Chicago, he talks about the one asset that downtown has, which is the DIA. In the meantime, Christie’s appraisers continue to assign dollar values to works of art at the DIA. Their work will be completed soon. The accuracy of their valuation was questioned by an audience member, given the fact that many of the masterworks have not changed hands in many generations and there are no comparable figures to rely on. And the concept of a swift auction of hundreds, if not thousands, of works of art is unrealistic. Ultimately, the proceeds from such a sale would satisfy only a small percentage of the city’s debt. Audience members asked what they could do to assist the situation. The petition that originated with Jeffrey Hamburger at Harvard University still is being circulated and IFAR asked that people sign it. CAA has circulated this electronic petition to members and it remains on the CAA website for those interested in signing it. Beal would prefer to absent the DIA from the center of this controversy since there are several other possibilities of relieving the city’s debt. The last rumor that Beal heard was that the emergency manager has taken the collections off the bankruptcy table. Meanwhile the work of a great museum continues. Graham W. J. Beal, director of the Detroit Institute of Arts, wrote that Gene Gargaro, the DIA’s chair of the board, has had three meetings with the emergency manager’s lawyer and the restructuring specialist. The first meeting was with Gargaro alone, the second with Beal and the museum’s top attorney, and the third with the DIA’s chief operating officer, top lawyer, and bankruptcy adviser (panelist Rich Levin). The tenor of the meetings was driven by the emergency manager’s people’s persistent demand that DIA come up with about $500 million. The executive director of the National Humanities Alliance (NHA) sent the following email on October 25, 2013.
upcoming humanities policy and advocacy events. We hope that this monthly memo will provide you with tools to aid your advocacy efforts and help you and your organization stay abreast of policy and advocacy news. If you have information to to suggest for a future edition, please contact Erin Mosley at emosley@nhalliance.org. Click here to download the briefing in pdf. 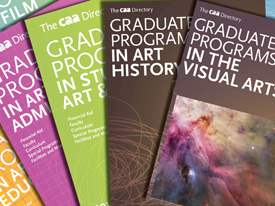 New editions of CAA’s comprehensive directories of graduate programs in the arts are now available for purchase, featuring updated information about 630 schools in the United States, Canada, the United Kingdom, Europe, and beyond. Entries from the following eight program types are available: History of Art and Architecture; Studio Art and Design; Curatorial and Museum Studies; Arts Administration; Art Education; Library Science; Film Production; and Conservation and Historic Preservation. The directories are currently available for purchase as customized PDFs, created on demand based on the customer’s preferred search criteria. Anyone can search the directories online by program type, faculty specialization, degrees awarded, country, region, state, availability of health insurance, and whether or not part-time students are admitted; you may also browse by institution. Search results include the program type, its location, and the program name and description, while the purchased PDF gives an in-depth profile of each program (see sample entries). Printed volumes and ebooks will be available for purchase in early November. CAA’s directories provide prospective graduate students with the information they need for the application process and beyond. The publications are also key professional references for career-services representatives, department chairs, graduate and undergraduate advisors, librarians, professional-practices educators, and professors interested in helping emerging generations of artists and scholars find success. For questions about purchasing, please contact Roberta Lawson at rlawson@collegeart.org or 212-392-4404. Is Art to Blame for Gentrification? Are Artists to Blame for Gentrification? The Women’s Caucus for Art (WCA) has announced the recipients of its 2014 Lifetime Achievement Awards: Phyllis Bramson, Harmony Hammond, Adrian Piper, and Faith Wilding. The winners of the 2014 President’s Art and Activism Award are Janice Nesser-Chu and Hye-Seong Tak Lee. Please join WCA for an awards celebration on Saturday, February 15, 2014, in Chicago, Illinois. The event will be held during the annual WCA and CAA conferences. The awards ceremony, open free of charge to the public, will take place from 6:00 to 7:30 PM, followed by a ticketed gala from 8:00 to 10:00 PM at the Museum of Contemporary Art, Chicago. The ticketed gala will include a walk-around gourmet dinner, open bar, and the opportunity to congratulate the awardees. Individual tickets may be purchased online for $150 prior to January 7 and for $165 thereafter. Phyllis Bramson is an artist and educator whose recent works use folly and innuendo as narrative tactics to embody exaggerated fictions about love. Infused with amusing anecdotes about life’s imperfections, her sensuous paintings are miniaturized schemes meandering through love, desire, pleasure, tragedy, and cosmic disorder. Bramson received her MFA from the School of the Art Institute of Chicago and taught for twenty-two years at the University of Illinois, Chicago, where she is now professor emerita. Since 2007, she has advised MFA students at the School of the Art Institute of Chicago. Bramson has shown her work in over thirty solo and innumerable group exhibitions across the United States. In 2013, she will have one-person shows at Zolla/Lieberman Gallery in Chicago and at Littlejohn Contemporary in New York. Bramson was selected for the Annual Artists’ Interviews at CAA’s 2010 Annual Conference in Chicago, and in 2012 she received the Distinguished Artist of the Year/Chicago from the Union League Club of Chicago. Harmony Hammond is an artist, writer, and educator who was a leading figure in the feminist art movement in New York in the early 1970s, cofounding A.I.R., the first women’s cooperative art gallery in New York, and the journal Heresies: A Feminist Publication on Art and Politics. Her earliest feminist work combined gender politics with Postminimal concerns of materials and process, frequently occupying a space between painting and sculpture. Since 1984, Hammond has lived and worked in northern New Mexico. She taught at the University of Arizona in Tucson from 1998 to 2006. Hammond’s Wrappings: Essays on Feminism, Art, and the Martial Arts (1984) is a seminal publication on 1970s feminist art, and her book Lesbian Art in America: A Contemporary History (2000) received a Lambda Literary Award. Her artwork has been exhibited internationally and was featured in High Times, Hard Times: New York Painting 1967–1975 (2006–8) and WACK! Art and the Feminist Revolution (2007–8) In 2013, Hammond was honored with CAA’s Distinguished Feminist Award. Adrian Piper is a conceptual artist and analytic philosopher. She received a BA in philosophy with a minor in medieval and renaissance musicology from the City College of New York and a PhD in philosophy from Harvard University. Piper became the first tenured African American woman professor in the field of philosophy. For her refusal to return to the United States while listed as a suspicious traveler on the Transportation Security Administration’s watch list, Wellesley College forcibly terminated her tenured full professorship in 2008. In 2011, the American Philosophical Association awarded her the title of professor emeritus. Piper’s two-volume, open-access study in Kantian metaethics, Rationality and the Structure of the Self, Volume I: The Humean Conception and Rationality and the Structure of the Self, Volume II: A Kantian Conception, was accepted for publication by Cambridge University Press in 2008 and praised as “groundbreaking,” “brilliant,” “indispensable,” and “original and important.” Piper introduced issues of race and gender into the vocabulary of Conceptual art as well as explicit political content into Minimalism. In 2000, she further expanded the vocabulary of Conceptual art to include Vedic philosophical imagery and concepts. Her artwork has enjoyed numerous national and international traveling retrospectives. She received CAA’s Artist Award for Distinguished Body of Work in 2012. Piper lives and works in Berlin, where she runs the Adrian Piper Research Archive Foundation Berlin. Faith Wilding is an intermedia artist, writer, and educator. She is professor emerita of performance art at the School of the Art Institute of Chicago, a graduate faculty member at Vermont College of Fine Arts, and currently a visiting scholar at Brown University’s Pembroke Center for Teaching and Research on Women. Born in Paraguay, Wilding received a BA from the University of Iowa and an MFA from California Institute of Arts (CalArts). Wilding was a co-initiator of the Feminist Art Programs at Fresno State College and at CalArts and key contributor to the Womanhouse exhibition in 1970–71 with her Crocheted Environment installation and her Waiting performance. Her work with the feminist art movement in Southern California was chronicled in her book By Our Own Hands (1977) and later in The Power of Feminist Art (1994), edited by Norma Broude and Mary Garrard. Wilding’s art, which addresses the recombinant and distributed biotech body in two-dimensional and digital media, audio and video, and installations and performances, has been featured in major feminist exhibitions, including WACK! Art and the Feminist Revolution (2007–8), Sexual Politics (1995), Division of Labor: Women’s Work in Contemporary Art (1995), and re.act.feminism (2009). Wilding cofounded and collaborates with subRosa, a cyberfeminist cell of cultural producers using bioart and tactical performance in the public sphere to explore and critique the intersections of information and biotechnologies in women’s bodies, lives, and work. She is also the coeditor of Domain Errors! Cyberfeminist Practices! (2002). Janice Nesser-Chu is an educator, mixed-media artist, and activist in the arts community. Her life’s work has centered on social activism, education, mentorship, and promotion of women in the arts. Nesser-Chu serves as the Legacy Campaign Director on the national board of WCA, on the WCA Saint Louis chapter board, and on the board of directors for ArtTable. Nesser-Chu was president of WCA from 2010 to 2012 and has served on the organization’s board for over eight years. She coordinated the 2011 Art and Social Justice Conference and sat on the advisory board and steering committee for the 2012 Cross-Cultural Engagement: Building a Diverse and Dynamic Community Conference, both held in Saint Louis. She recently served on the Forums Committee for Art Saint Louis and is a founder and past board member of the Northern Arts Council. Nesser-Chu is chair of the Arts and Humanities Department and a professor of art at Saint Louis Community College, Florissant Valley. Previously she served as the director of the school’s galleries and permanent collection and coordinator of the photography program. Nesser-Chu established the Women’s History Month (WHM) and World AIDS Day/Quilt display programs on her campus and continues to serve as the coordinator for WHM. She has a master’s degree in art from Webster University and a BA in journalism with a minor in political science from Saint Mary-of-the-Woods College. Nesser-Chu has exhibited internationally for over twenty years. Hye-Seong Tak Lee is an artist, curator, and lecturer from Gwangju, South Korea. While residing in various cities in North America over a ten-year period, she was active in immigrant communities, helping emerging artists enrich their environment through multicultural exhibitions. Since returning to South Korea, she has worked with expatriate artists to broaden her country’s cultural tolerance and expand the society of artists through events such as art classes, workshops, mural projects, and exhibitions. Lee is particularly determined to expand the visibility of women artists in Korea, whose accomplishments have been all but ignored because of the country’s focus on other significant democratic issues. In partnership with WCA’s International Caucus, Lee mounted the 2012 exhibition Woman + Body in Seoul and Gwangju. A survey of contemporary sexual personae—female, transgender, and male—Women + Body raised questions about stereotypes and prejudice, presented diverse points of view, and showcased significant Korean activist women artists spanning several generations, together with WCA activist women artists from the United States. Lee also participated in panel discussions related to gender policies and lectured on the contributions of women in the arts. Woman + Body opened the door for strengthening and widening women artists’ networks for both Koreans and Americans. Lee looks forward to curating more exhibitions with talented women artists from all over the world. WCA’s Lifetime Achievement Awards were first awarded in 1979 in President Jimmy Carter’s Oval Office to Isabel Bishop, Selma Burke, Alice Neel, Louise Nevelson, and Georgia O’Keeffe. Past honorees have represented the full range of distinguished achievement in the arts professions. This year’s awardees are no exception. The President’s Art and Activism Award is awarded each year to emerging or midcareer women whose life and work exemplifies WCA’s mission of creating community through art, education, and social activism. Founded in 1972 in connection with CAA, WCA is a national member organization unique in its multidisciplinary, multicultural membership of artists, art historians, students, educators, and museum professionals. WCA is committed to recognizing the contribution of women in the arts; providing women with leadership opportunities and professional development; expanding networking and exhibition opportunities for women; supporting local, national, and global art activism; and advocating equity in the arts for all. Patricia Cronin. Musei Capitolini, Centrale Montemartini Museo, Rome, Italy, October 9–November 20, 2013. Le Macchine, Gli Dei e I Fantasmi (Machines, Gods and Ghosts). David Holt. Loop Gallery, Toronto, Ontario, Canada, September 14–October 6, 2013. Illustrated History. Painting. Hee Sook Lee-Niinioja. Fallesmanni Exhibition Hall, Loppi, Finland, July 8–31, 2013. Goethe in Me. Installation and painting. Firoz Mahmud. Goethe Institute Art Space, Dhaka, Bangladesh, October 1–21, 2013. Soaked Dream. Photography, objects, and performance. Firoz Mahmud. Dhaka Art Center, Dhaka, Bangladesh, September 3–12, 2013. Loss of the Toss Is Blessing of Their Disguise. Photography and drawing. Jan Wurm. Dorfgalerie, Neumarkt an der Raab, Austria, August 8–September 29, 2013. Magic Moments. Les Barta. Edward Williams Gallery, Fairleigh Dickinson University, Hackensack, New Jersey, December 3, 2013–January 18, 2014. Works by Les Barta. Digital prints of photoconstructions. Cianne Fragione. Brentwood Arts Exchange, Gateway Arts Center, Brentwood, Maryland, November 4–December 28, 2013. My Haiku. Work on paper and painting. Margi Weir. Sheetz Gallery, Misciagna Family Center for the Arts, Pennsylvania State University, Altoona, Pennsylvania, September 5–October 13, 2013. An Ivyside Exhibition by Margi Weir. Painting and vinyl installation. Michelle Kogan. Peggy Notebaert Nature Museum, Chicago, Illinois, July 13–October 13, 2013. Narratives of Nature Watercolors by Michelle Kogan. Watercolor. R. C. Sayler. Peoria Art Guild, Peoria, Illinois, June 29–August 7, 2013. HOME ALONE. Mixed-media installation, sculpture, and painting. Betsy Stirratt. Packer Schopf Gallery, Chicago, Illinois, September 6–October 19, 2013. Half-Light. Painting. Anne Wilson. Rhona Hoffman Gallery, Chicago, Illinois, October 18–December 7, 2013. Dispersions. Phyllis Bramson. Littlejohn Contemporary, New York, September 3–28, 2013. Small Personal Dilemmas. Painting. Sharon L. Butler. Fine Arts Gallery, Westchester Community College, State University of New York, Valhalla, New York, September 3–November 24, 2013. Dense Surveillance. Painting and drawing. Steve Locke. Institute of Contemprary Art, Boston, Massachussets, July 31–October 27, 2013. Steve Locke: there is no one left to blame. Painting and sculpture. Allison Smith. Aldrich Contemporary Art Museum, Ridgefield, Connecticut, May 27–September 2, 2013. Rudiments of Fife and Drum. Mixed media. Linda Stein. Perrella Gallery, Fulton-Montgomery Community College, State University of New York, Johnstown, New York, October 17–December 13, 2013. The Fluidity of Gender: Sculpture by Linda Stein. Sculpture. Blaise Tobia. O. K. Harris Works of Art, New York, September 21–October 26, 2013. Blaise Tobia: Binary Codes. Paired photographic images. Josette Urso. Kathryn Markel Fine Arts, Bridgehampton, New York, July 10–24, 2013. Josette Urso: Recalibration. Painting. Jill Bedgood. Blue Star Contemporary Art Museum, San Antonio, Texas, June 6–August 24, 2013. Book of Hours: Intervention. Installation of twenty-five cast booklike objects. Kyra Bélan. Arts for ACT Gallery, Fort Meyers, Florida, September 6–29, 2013. Dr. Kyra Bélan: Sacred Ladies. Painting. Lee Ann Paynter. Kaviar Forge & Gallery, Louisville, Kentucky, September 27–November 2, 2013. SHE. Photography and sculpture. Jan Wurm. Peacock Gallery, Middle Georgia State College, Cochran, Georgia, August 26–September 27, 2013. Jan Wurm: Drawings. Drawing. Steven Bleicher. Branigan Cultural Center, Las Cruces, New Mexico, October 4–26, 2013. Route 66: The Mother Road. Drawing, digital media, and mixed media. Katie Herzog. Night Gallery, Los Angeles, California, June 29–August 3, 2013. Transtextuality (SB 48). Painting. On the occasion of its fifteenth anniversary, caa.reviews launched a new series: Re-Views: Field Editors’ Reflections. Authored by members of the journal’s Council of Field Editors, the series provides a locus for editors to reflect upon their respective fields as seen through the lens of the reviews they have commissioned. The first essay in the series, titled “Reflections on Photography,” is by the field editor for photography and editorial-board member Tanya Sheehan, an associate professor in the Department of Art at Colby College in Waterville, Maine. In this essay Sheehan assesses the topics, methodologies, and debates current in publications about photography over the past several years. Themes she addresses include the global reach and significance of photography, political considerations, the play between “art” and “vernacular” in photography studies, and future directions for the field. 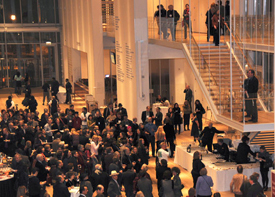 The Opening Reception for the 2014 Annual Conference will take place in the Art Institute of Chicago’s recently inaugurated Modern Wing on Wednesday evening, February 12, from 7:00 to 9:30 PM. Designed by the Pritzker Prize–winning architect Renzo Piano, this stunning addition to the venerable institution provides a new home for the museum’s renowned collection of twentieth- and twenty-first-century art. Tickets are required for admission and cost $35 for members and $45 for nonmembers. Availability is limited; please purchase your ticket online by January 10, 2014. Tickets will not be sold at the door at the Art Institute of Chicago. The Modern Wing of the Art Institute of Chicago during the reception for the CAA Annual Conference in 2010 (photograph by Bradley Marks).